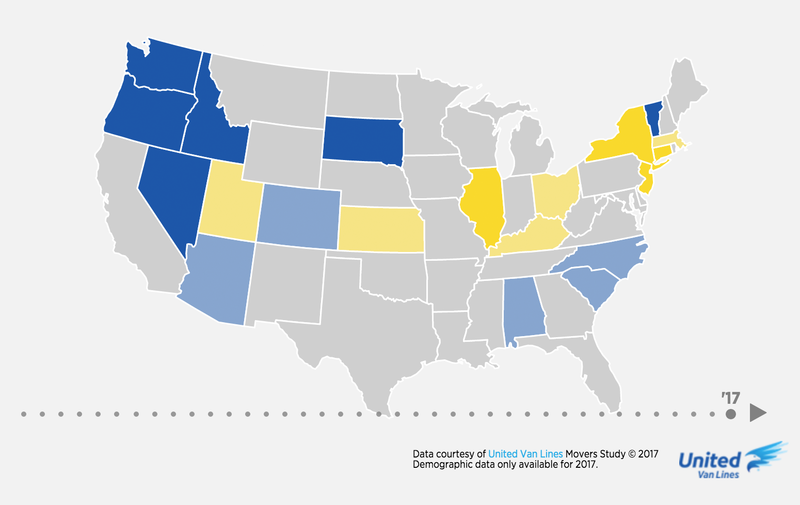 State-to-state migration may be the single greatest tool for comparing the quality of life in different states. Through moving, people reveal their preferences for where they wish to live. Opportunity is a major reason they move between states. That’s what makes the annual United Van Lines report on client moves so interesting. The company, the largest household goods mover in the country, annually publishes its United Movers Study, which reports shipments of its clients around the contiguous 48 United States. The company then classifies states as “high outbound,” “high inbound” and “balanced,” depending on customer data. Four years ago, Michigan went from a high outbound move state (more than 55 percent of moves were outbound) to a balanced one — for the first time in 16 years. For every 10 percent increase in personal taxes, we estimate, we chase away 4,700 people every year thereafter. We are still losing citizens to other states though, based on data from United. In 2017, 51.9 percent (2,362) of its shipments were outbound. That’s still not an ideal position, but it is a much improved one from 2006-2009, when we sported the highest outbound traffic rate in the study. While this is just one company’s report, it may be a good indicator for the direction of economic data. In the past we have run a statistical analysis of United data with actual census data and found the two are highly correlated. For 2017, Midwestern Illinois holds the dubious distinction of being No. 1 state for outbound traffic. That is, 63 percent of United’s Illinois-related traffic was outbound. That is no small thing. When people move away from a state, they take their wealth, talent and the state’s future with them. They add all these qualities to their new home state. This Illini diaspora is not lost on many observers, including The Wall Street Journal and Mackinac Center scholars, as it has implications for the Great Lake State. Of course, we in Michigan should not take any joy from the pain of Illinois. It was not long ago that Michigan held the No. 1 spot for outbound moves. Indeed, in 2009, Michigan’s outbound move rate hit 68 percent, a record in the data. The Great Lake State turned its fortunes around, however, and very likely because it adopted market-friendly tax and labor reforms. Much more can be done to attract people from other states to Michigan. In 2008 the Mackinac Center attempted to identify what factors drive people to and from Michigan. We found through a sophisticated statistical analysis that, among other things, personal taxes, flexibility in labor markets and more days of sunshine were important. We can’t overcome Michigan’s lack of sunshine, but we can make up for it on other fronts, such as cutting taxes. For every 10 percent increase in personal taxes, we estimate, we chase away 4,700 people every year thereafter. If we want to make Michigan a state that opportunity-seeking migrants want to move to, we could start by lowering the state’s personal income tax rate and reforming many of the licenses required to hold a job here. This will make it easier to work, live and raise our incomes and our families, be they originally from Illinois, Florida, Texas or anywhere else.